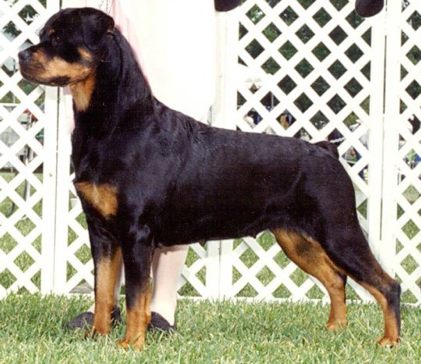 Ch Marlo’s Bella Luna Angela was a standout from the beginning with her natural stage presence and her ideal Rottweiler head. Her face has both an expression of good character and correct structure. 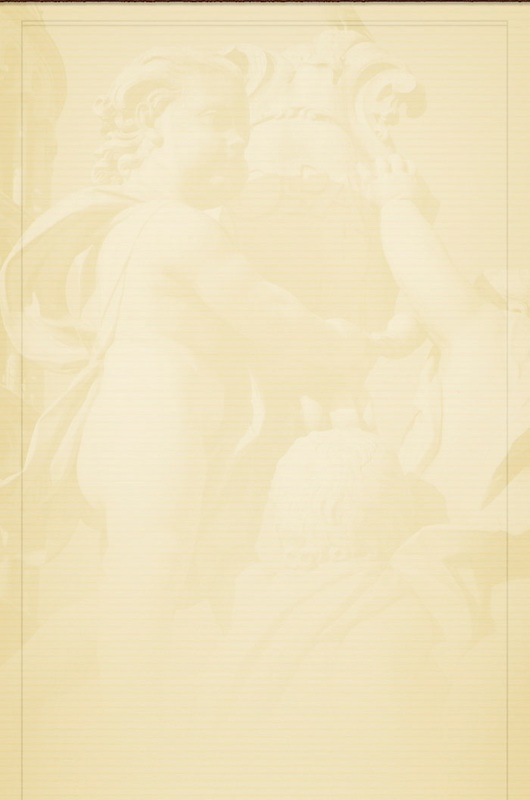 Her nurturing and stable temperament made living with her pure joy. 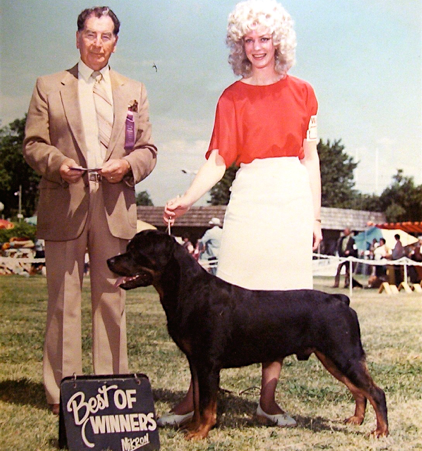 In conformation she won her first Best of Breed at the tender age of twelve months and finished her A.K.C. championship before the age of 18 months. 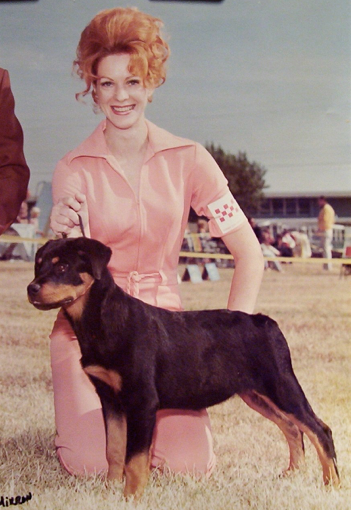 But her best performance as a dam, was her gift to the breed. She is a wonderful mother and a Producer of Merit. 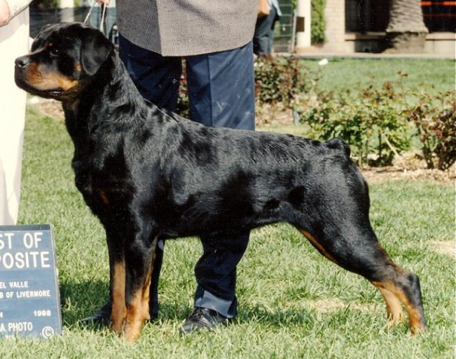 We are proud of her produce because they represent the Rottweiler daily in Search and Rescue, Schutzhund, Conformation and in their devotion to their families. Her warm cuddly presence is greatly missed. 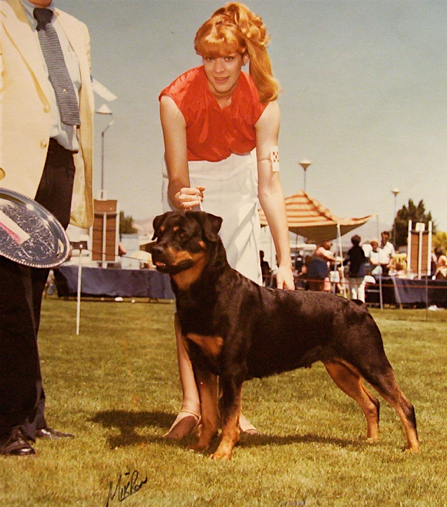 Ch Marlo’s RJ Baer v Rome was a good dog and he would hand me his paws to cut his nails. He never refused me anything or challenged me ever. He would always let me be the leader of the pack. He was very obedient and loyal. He had a very noble and quiet demeanor. Like his mother, Heidi, he had a big heart and did not need to rule outwardly but instead quietly. 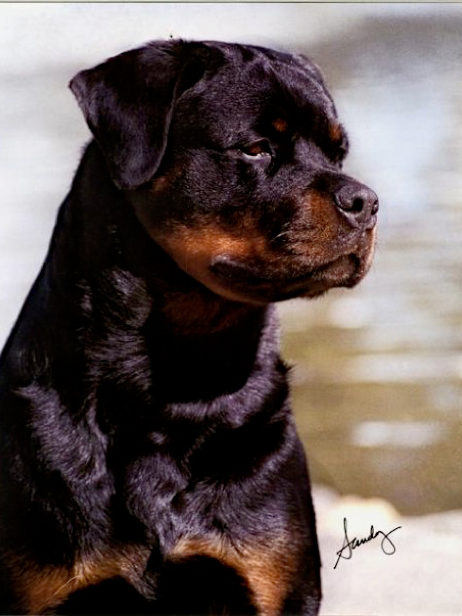 He allowed me to have an intact male Bullmastiff live with my four Rottweilers in my home. My memories of when I lived with RJ are of happy joyful times. 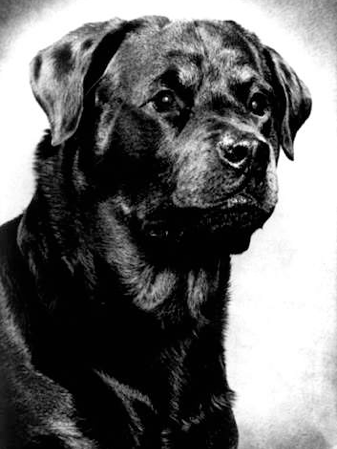 Ch Marlo’s Rome da Bratiana CD was a discriminating dog, not clownish but dignified. He had a savior faire, in that he just knew what to do. He was a strong male, the leader of our pack and my soul mate who was protective and possessive of me. When I slept at night, he would take his position at my bedside. But when it was time for him to leave me for the rainbow bridge, he spent his final days up on the bed at my side. It was a thrill a minute for me to attain his championship as an owner/breeder handler from the prestigious class of Bred by Exhibitor. 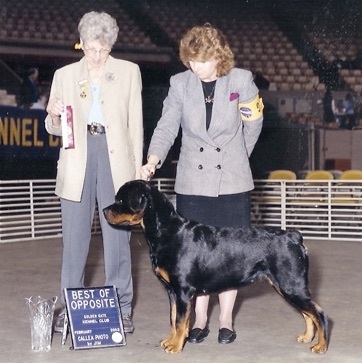 I remember being very honored to win major points from the bred by exhibitor class under breeder judge, Barbara Hoard Dillion of Panamint Rottweilers. I also owner handled him to multi BOB wins and multiple group placements. 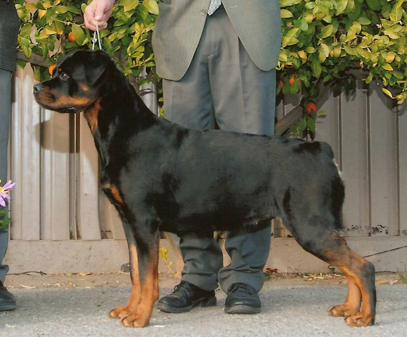 Ch Hug-a-Rotts Heidi v Axel is a Rottweiler angel. In her life here on earth, she was a very gentle soul and never had a complaint. She gave me a gentleness in my life. She was too good for me and should have lived in a convent with a statue erected, Saint Heidi. She also had great strength inside her and was a formidable protector of hearth and home when needed. She welcomed KCRA 3 News with all their camera equipment and lights to our home at 11 pm one night just because I said it was okay. 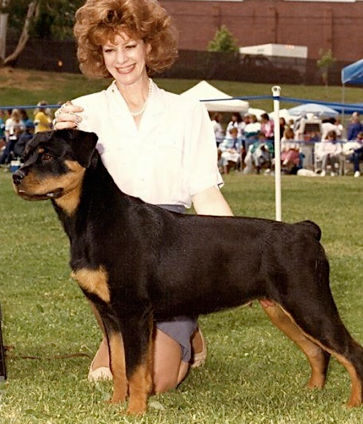 She impressed the news crew and represented the Rottweiler breed admirably for their special program which explored a broader perspective about dog breeds in reaction to a recent dog attack that had been in the news. 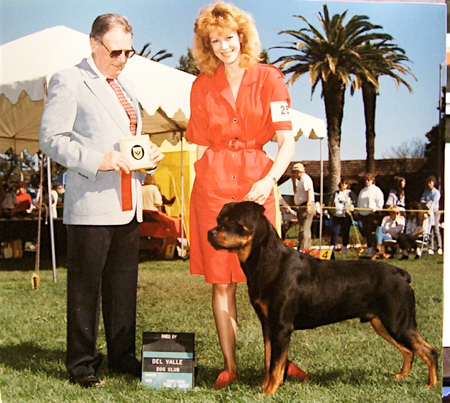 My family of Rottweilers, Heidi, Bella, RJ and Lena represented the Rottweiler breed with pride and strength in front of the cameras that night just as they always did. Heidi was a dutiful mother. 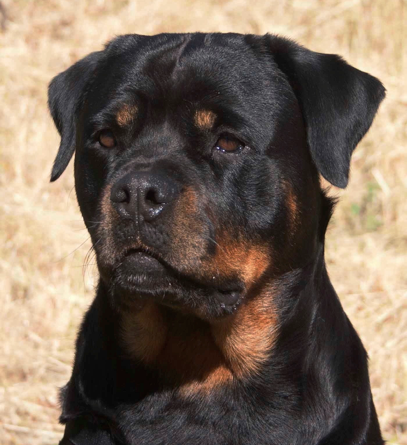 And because of her good gentle temperament I was able to have the strong tempered Lena join our family. 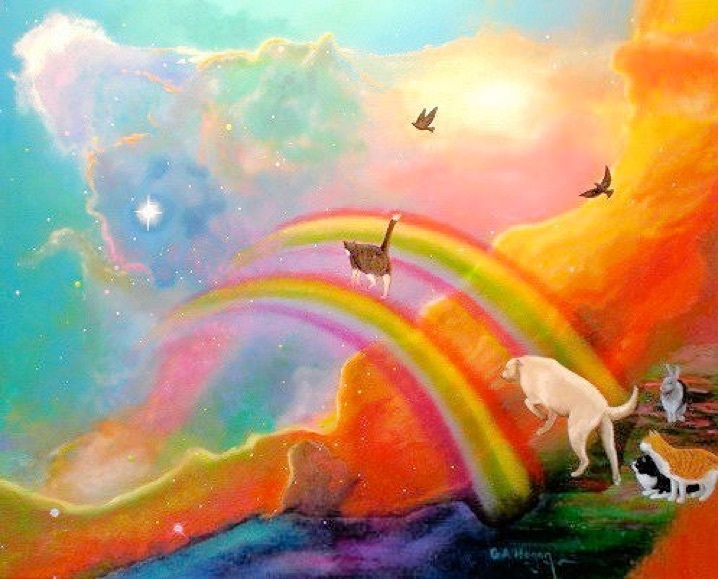 I am certain Heidi was awarded her wings in heaven and is utilizing them to fly and watch over the rainbow bridge.